The largest state park in New York City will open next summer in Brooklyn and be named after Shirley Chisholm, the first black woman elected to Congress and a native of the borough. Gov. Andrew Cuomo announced Wednesday that the first phase of the 407-acre park on Jamacia Bay will be completed in 2019. 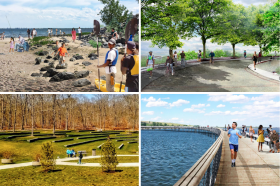 The site, formerly home to two landfills, will be converted into parkland with 10 miles of trails for hiking and biking, kayaking, picnic areas, educational facilities, an amphitheater and more.